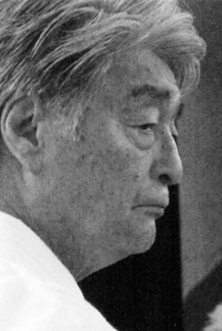 Yoshimitsu Yamada Shihan, 8th Dan Aikido, was born on February 17, 1938 in Tokyo, Japan. He studied at Aoyama Gakuin University. 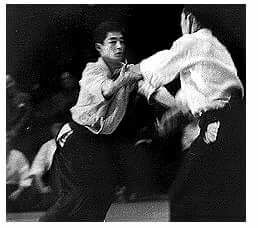 In 1955 he was accepted as an Uchideschi (internal student) at Hombu Dojo, to study Aikido with the great master Morihei Ueshiba. In 1964 travels he traveled to the US and established the New York Aikikai (now with over 300 members). 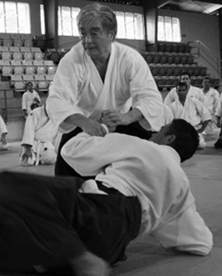 In order to spread the art of aikido he has traveled extensively in the US, Canada, South America, Europe and Africa. Yamada Sensei is currently the President of the U.S.A.F (United States Aikido Federation), Consultant Member of the I.A.F. (Internatiol Aikido Federation) based in Tokyo and founder of the SANSUIKAI Aikido Federation in Europe and South America. 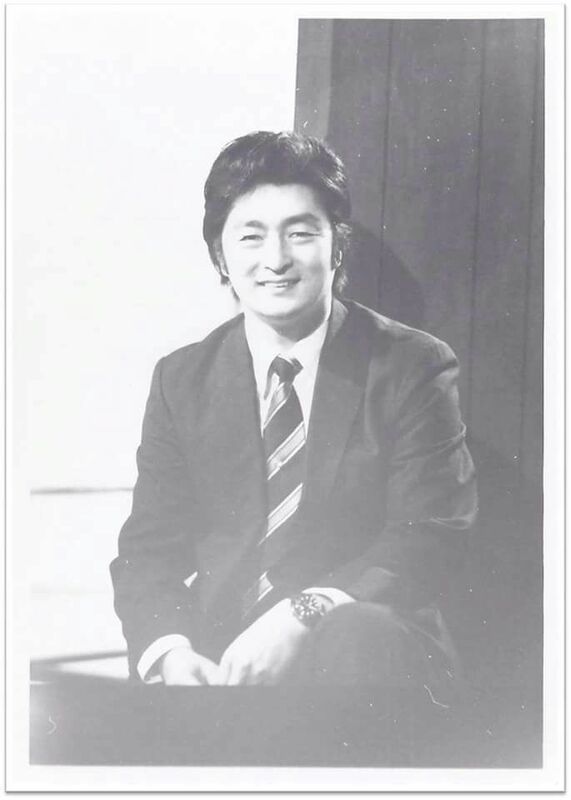 Yoshimitsu Yamada was born on February 17, 1938 in Tokyo. 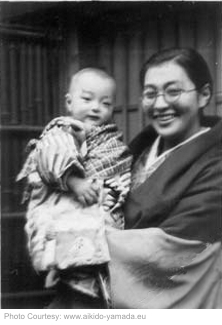 His father, Ichiro, was an academic professor and his mother, Michio, took care of the house. 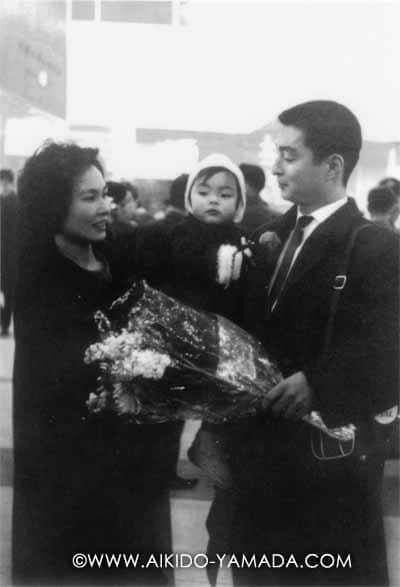 His father's family was related to the Abe family and when as a child Ichiro lost his parents, Abe adopted him. The plight of Japan during World War II forced both families to emigrate to Korea in the nineteen-forties and they settled in Chinju, a small town about 200 miles from Seoul. The head of the , family Kazo, rented land and had his own business, and Ichiro Yamada went into the business of mining. They stayed in Korea until the end of the war. 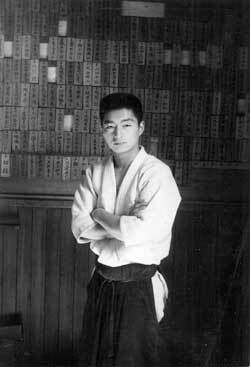 Tadashi Abe, a cousin of Ichiro Yamada, began practicing aikido in 1942. This influence undoubtedly affected the life of Yoshimitsu. When only a few years old, Yoshimitsu had contact with O'Sensei before they went to Korea during a martial arts presentation in the Abe traditional family house. This encounter left an unforgettable impression. He remembers, as if it were today, the nice, quiet old man, which is like O'Sensei seemed at first glance, yet he became someone totally different on the tatami, an elusive and mysterious master of martial arts. This first Meeting with O'Sensei probably influenced the decision of eighteen year-old Yoshimitsu, who in 1955 decided to join Hombu dojo as uchideshi. This may have been due to the recommendation of Tadashi Abe, as the young Yoshimitsu had never trained in martial arts. His first day as uchideshi was also his first day on the tatami. He immediately became friends with his sempai Nabuyoshi Tamura and Sadateru Arikawa. Hombu Dojo at that time was a completely different place than today. The house was part of the family Ueshiba dojo, and Morihei, irregularly but very often appeared on the tatami. O'Sensei represented an unparalleled authority for all uchi-deshis. With his behavior he represented all the qualities that a young Japanese struggled to attain at that time. The trainings were demanding and life in a dojo almost ascetic in nature. This was due to the difficult economic situation in the country after World War II. Hombu Dojo did not stand out particularly in relation to the general standard of living in Japan. The building had no heating so the winter temperature was often below zero degrees and in the summer the heat was extreme. The deshi had no private rooms or too many personal things, his life was subject to the rhythm of life of the dojo and there were rare moments of privacy. Each uchideshi had to do certain tasks and participate in private lessons. Yoshimitsu Yamada still remembers the schedule today. The first training session, led by Kisshomaru Ueshiba, began at 6:30 in the morning. Then had another class at 8:00 taught by Koichi Tohei or Kisaburo Osawa, who once a week was replaced by Kenji Tomiki. Hiroshi Tada or Seigo Yamaguchi gave the class from 15:00 to 16:00 and classes at18:30 were given by different teachers. 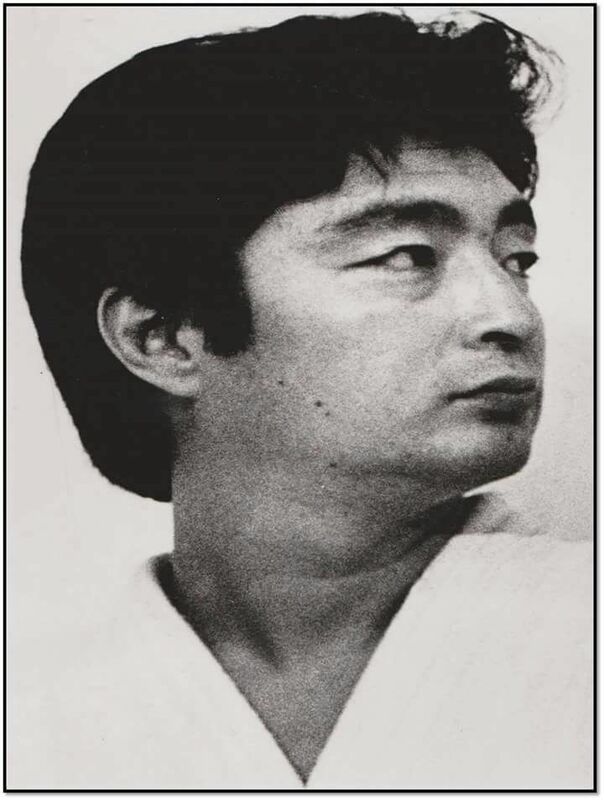 Koichi Tohei was an idol for many practitioners, who were impressed with his character and technical skills. Many uchi-deshi lamented that he was increasingly more involved with managing the school in Hawaii and was rarely able to go to Tokyo. 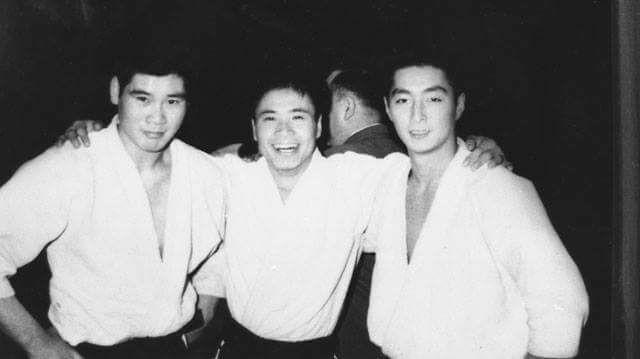 Over time, the group of students was growing as Yasuo Kabayashi, Kazuo Chiba, Mitsunari Kanai and Sugano Seichi along with Yoshimitsu Yamada, formed a close-knit group of friends. Despite their involvement in training and life of the dojo, each of the uchideshi’s secretly dreamed of leaving Japan when, after the American occupation, it opened to the world. 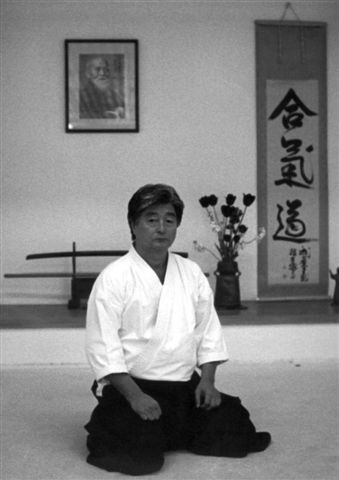 Yoshimitsu Yamada, as a delegate of Hombu Dojo, taught aikido at American military bases. He perfected his English and the culture and traditions that fascinated him. He wanted to go to America. In the early sixties he was presented with a chance. The pretext was the initiative of an American group of enthusiasts interested in Aikido. Eddie Hagihara from New York whom Yoshimitsu met personally in Japan, contacted Hombu Dojo. 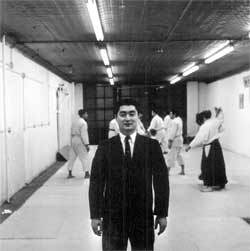 In 1964 he was asked by Headquarters Hombu Dojo to do an exhibition of aikido at the International Fair in New York. At first the dojo was to be represented by Koichi Tohei, but due to injury they had to change plans and sent Yoshimitsu Yamada to New York. Seizing the opportunity he met his American friends and agreed to start the Aikido School of New York. However, their fate could have been completely different since by that time Tadashi Abe had been in France and Yoshimitsu aspired to succeed him. But his friend and sempai, Nabuyoshi Tamura, who was the main person of the European aikido, beat him there and Yoshimitsu Yamada was delegated to the East Coast of the United States. He chose New York as the headquarters.. 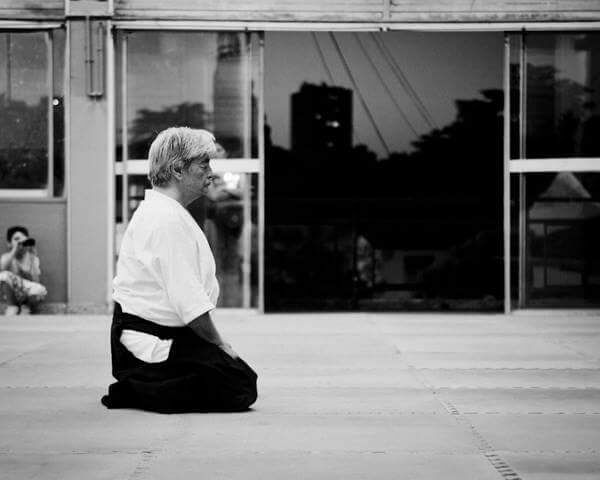 The beginnings are always difficult, but what the young aikido teacher faced in New York required enormous personal commitment, patience and effort. The New York group was not well organized, nobody had experience in managing a school of Aikido and Yoshimitsu had to do everything from scratch, from organizational matters to teaching techniques. 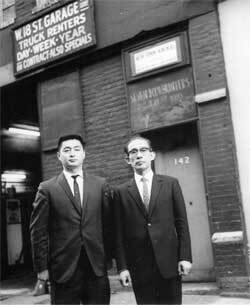 Lack of financial resources did not provide an ideal situation and together with the first uchideshi in New York, Angel Tineo-Alvarez, he lived and slept in the dressing room because renting an apartment was just a dream. All the money went to school maintenance and prospects were not promising. 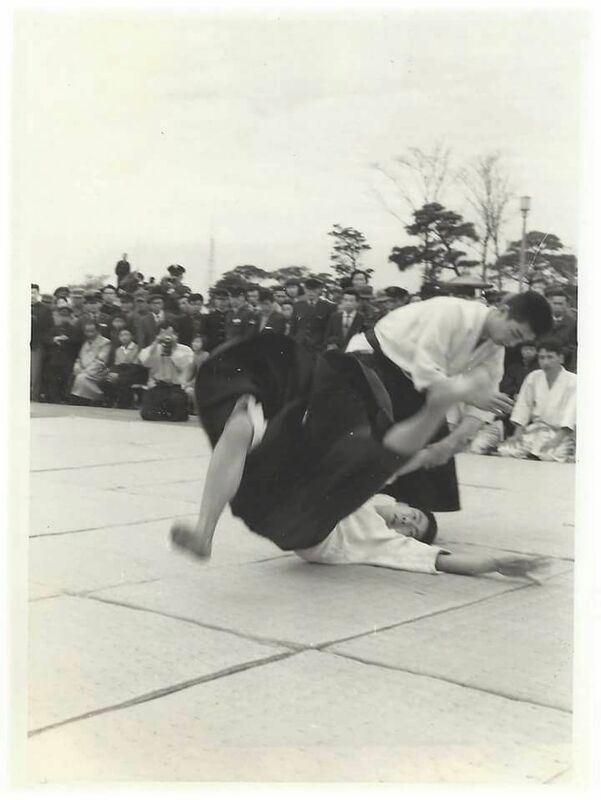 Aikido was not well known on the East Coast of the US and the possibility of promoting a new martial art using traditional methods were limited due to economic reasons, and advertising in the media was very expensive. The only viable way was to present aikido in public exhibitions. Fortunately, thanks to the kindness of other martial arts schools, opportunities abounded for public demonstrations, for example during karate championships. Hence, many students came from other martial arts dojos and wanted to try the new art. 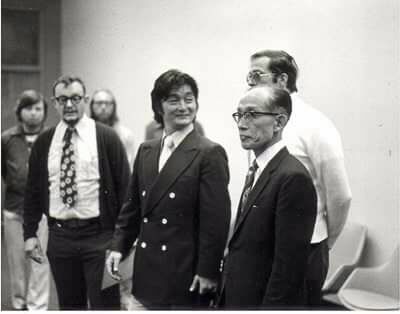 These early years were a major challenge for Yoshimitsu, although he was strongly supported by his students, who were involved in affairs of the dojo, among whom were Mike Abrams, Harvey Konigsberg, Harry McCormack. In the 60s there was an average of about 50 people training in the dojo. In the early years the chief instructor of NY Aikikai did not have much luck. His cultural exchange visa had did not guarantee a long stay in the US and that threatened him with being deported to Japan. They were also new problems with the birth of their children. The two who were US-born were granted citizenship and could stay. However, Yoshimitsu and his wife and eldest daughter, who was born in Japan could not stay. To try to protect his family from the ruthless immigration laws he took a difficult decision: his wife would return to his country with the children. This separation of his close family at the time, is something that Yamada Sensei regrets to this day. Slowly however, aikido was becoming attractive to people not only in New York but throughout the East Coast. This was mainly due to the incredible commitment of Yamada Sensei. So he traveled to Boston, southern New Jersey, Pennsylvania and Canada. Students began complaining that he was never in New York. However, as he was the only person with the right experience, he had to deal with everything. Yoshimitsu Yamada's actions were deliberate; work on the foundation at this time was the reason many students who are great teachers today have their own schools. His deep involvement in the mission for which he was sent to the US began producing effect. When the New York dojo became stable, the other popular aikido dojos in addition to New York Aikikai were operating effectively, it was time to establish an organization in order to formalize the structure and insure cooperation from an administrative point of view. 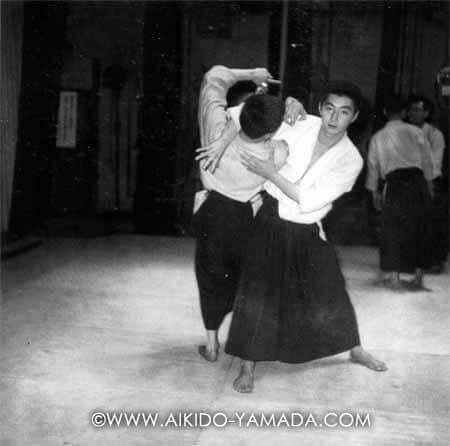 Thus, in 1968 the United States Aikido Federation (American Federation of Aikido) was created. This was due to the cooperation among the delegated Hombu Dojo teachers in the United States and it is now the largest organization in North America. When visa problems ended for Yamada Sensei in 1972, he started using his newly acquired freedom to promote aikido outside the United States. 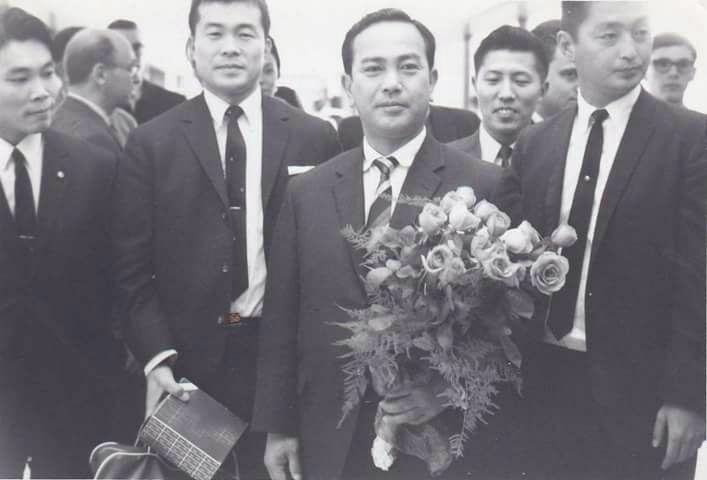 One of his first trips was on Sensei Tamura's invitation to France in 1973. The eighties was a relatively stable period. Two decades after installing the dojo in the US, he began a great summer camp in 1984 with the Doshu Kisshomaru Ueshiba. This focal point for testing was an incentive for students to work even harder. 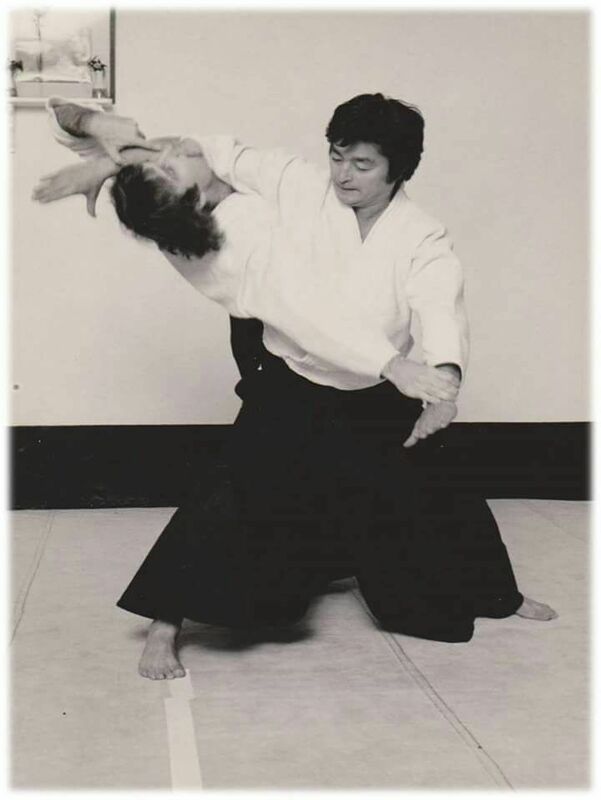 Sensei was now traveling more and more and in 1992 he invited Seichi Sugano Sensei to collaborate with him as an instructor at New York Aikikai. Friends of Hombu Dojo at times joined New York Aikikai giving the school a unique importance. 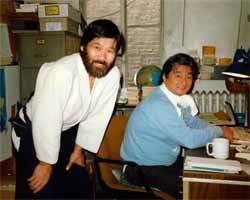 The New York dojo was the only school in the world in which two direct students of O Sensei taught together. Yamada Sensei recalls that only after 20 years did they begin to see the results of their work. 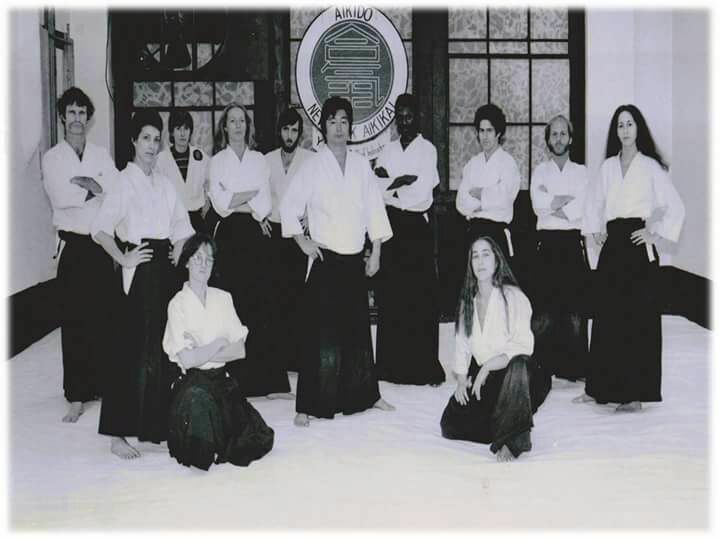 The first 10 years were devoted to the school in New York and the following 10 development of aikido on the East Coast. He says that thanks to the difficulties and problems faced along the way, he became more mature. Having reached fifty years he begans to accept the fact that people call him "Sensei". Before that he wondered "Have I earned the right for people to call me that?". Yoshimitsu Yamada spent about seven years at Hombu Dojo. Since that time the suite of techniques taught has changed a lot and aikido itself is slightly different martial art that the early uchideshi of Morihei Ueshiba learned. Despite this evolution, Yamada Sensei tries to convey the things he learned in that early time. His orthodox teaching, teaching the basic techniques, he tries never to change. Creating a solid foundation for proper development is necessary. It is an intense practice as a means of both physical and spiritual development. He was not opposed to the hard practice, in the spirit of Budo, but does not justify brutality or stupidity on the mat. Today he still travels extensively visiting almost every continent. 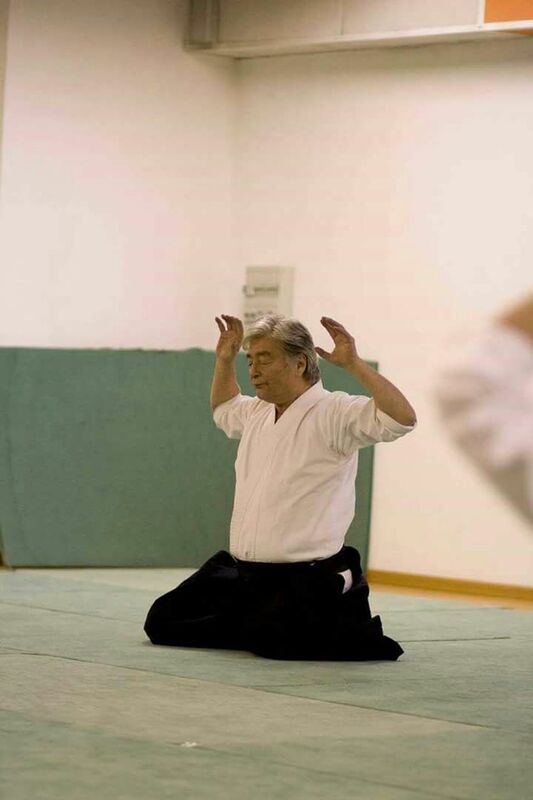 He is president of the American Federation of Aikido and Aikido SANSUIKAI International, an association that brings together all Latin American countries and countries from other continents. 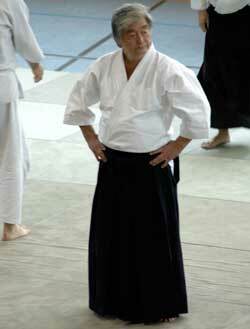 He is the author of numerous books and DVDs on aikido. 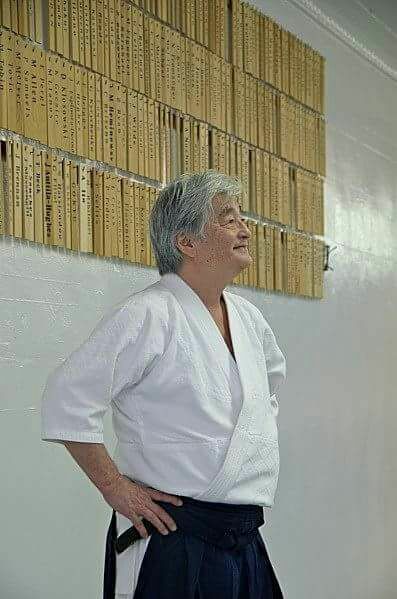 When asked what things he is most proud of, Yamada Sensei says his own dojo, the fact of having contributed to the development of aikido in the world and having helped many people to become excellent teachers of aikido. 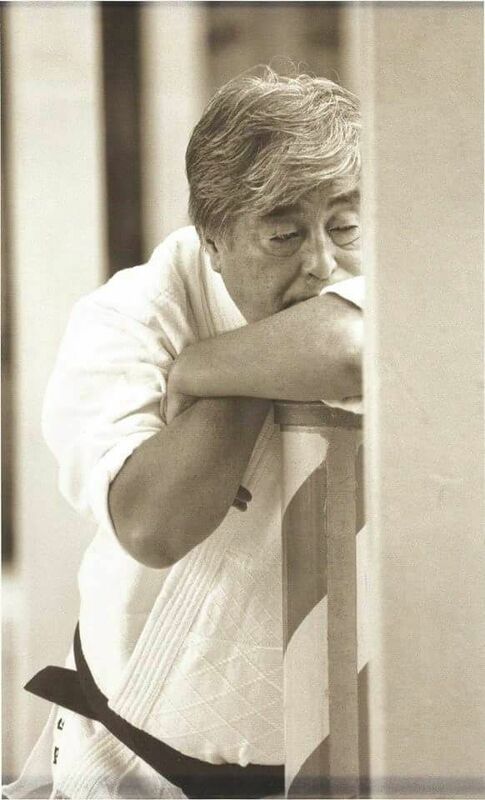 Yoshimitsu Yamada Shihan, 8º Dan de Aikido, nace el 17 de febrero de 1938 en Tokio, Japón. Realiza sus estudios en la Universidad de Aoyama Gakuin. 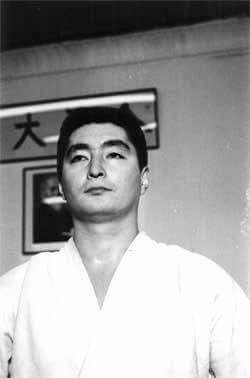 En 1955 es aceptado como Uchideschi (estudiante interno) en Hombu Dojo, para estudiar Aikido con el gran maestro Ueshiba Morihei. En 1964 viaja a EEUU y establece el New York Aikikai (hoy con más de 300 miembros). Con el propósito de difundir este arte realiza una intensiva enseñanza en EEUU, Canadá, América del Sur, Europa y África. Actualmente es el Presidente de la U.S.A.F (United States Aikido Federation), Miembro Consultor de la I.A.F. (Internatiol Aikido Federation) con sede en Tokio y Fundador de la Sansuikai. Yoshimitsu Yamada nació el 17 de febrero de 1938 en Tokio. Su padre, Ichiro, fue profesor académico y su madre, Michio, se ocupaba de la casa. La familia del padre era pariente de la familia Abe y cuando siendo niño, Ichiro perdió a sus padres, los Abe lo adoptaron. La difícil situación de Japón durante la Segunda Guerra Mundial obligó a ambas familias a emigrar a Corea en los años cuarenta y se instalaron en Chinju, una pequeña ciudad a unas 200 millas de Seúl. La cabeza de la familia, Kazo, alquilaba tierras y tenía su propio negocio, e Ichiro Yamada se dedicó a los negocios de minería. Se quedaron en Corea hasta el fin de la guerra. Probablemente está reunión influenció la decisión de Yoshimitsu de dieciocho años, quien en 1955 decidió unirse a Hombu dojo como uchi-deshi. Esto pudo ser gracias a la recomendación de Tadashi Abe, ya que el joven aspirante no había entrenado nunca en artes marciales. Su primer día como uchi-deshi fue también su primer día sobre el tatami. Enseguida se hizo amigo de sus sempais Nabuyoshi Tamura y Sadateru Arikawa. En esos tiempos Hombu Dojo era un lugar completamente distinto a hoy en día. La casa de la familia Ueshiba era parte del dojo, y Morihei, si bien irregularmente pero con mucha frecuencia, aparecía en el tatami. O’Sensei representó una autoridad sin igual para todos los uchi-deshis. Con su comportamiento representaba todas las cualidades por las que un joven japonés se esforzaba en esos tiempos. Los entrenamientos eran exigentes y la vida en el dojo de una naturaleza casi ascética. Esto era debido a la difícil situación económica del país después de la Segunda Guerra Mundial. Hombu Dojo no se destacaba particularmente del nivel de vida general de Japón. El edificio no tenía calefacción así que la temperatura en invierno descendía bajo cero grados, en verano el calor en general golpeaba. Los deshi no tenían un área de habitaciones ni demasiadas cosas personales, su vida estaba sujeta al ritmo de la vida del dojo y eran raros los momentos de privacidad. Cada uchi-deshi tenía que hacer ciertas tareas y participar en las clases privadas. Yoshimitsu Yamada aún hoy recuerda el horario. El primer entrenamiento, dirigido por Kishomaru Ueshiba, empezaba a las 6:30, luego había otro a las 8:00 por Koichi Tohei o Kisaburo Osawa, quien una vez por semana era reemplazado por Kenji Tomiki. Hiroshi Tada o Seigo Yamaguchi daban la clase de las 15:00 y las clases de las 16:00 y 18:30 estaban dictadas por diferentes profesores. 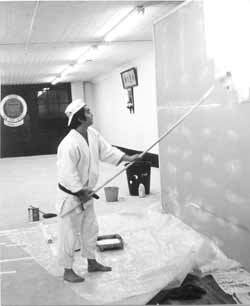 Koichi Tohei era un ídolo para muchos practicantes, que se impresionaban con su carácter y con sus habilidades técnicas. Muchos uchi-deshi lamentaban que cada vez se involucrara más con el manejo de la escuela en Hawai y que raramente fuera a Tokyo. Con el tiempo, el grupo de estudiantes fue creciendo con Yasuo Kabayashi, Kazuo Chiba, Mitsunari Kanai y Seichi Sugano quienes junto con Yoshimitsu Yamada, formaron un grupo de amigos muy unido. A principios de los años sesenta se presentó una oportunidad. 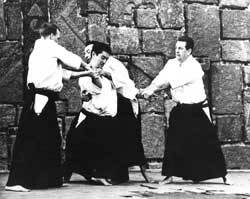 El pretexto fue la iniciativa de un grupo americano de entusiastas interesados en Aikido. Eddie Hagihara de Nueva York a quien Yoshimitsu conoció personalmente en Japón, se contactó con Hombu Dojo. En 1964 le pidieron a la Sede Central de Hombu que hicieran una exhibición de aikido en la Feria Internacional de Nueva York. Al principio el dojo fue representado por Koichi Tohei, pero debido a una lesión hubo que cambiar los planes y se envió a Yoshimitsu Yamada. Aprovechando la oportunidad se encontró con sus amigos americanos y aceptó ocuparse de la Escuela de Aikido de Nueva York. Sin embargo, su destino podría haber sido totalmente distinto ya que por ese tiempo Tadashi Abe ya había estado en Francia y Yoshimitsu aspiraba a sucederlo. 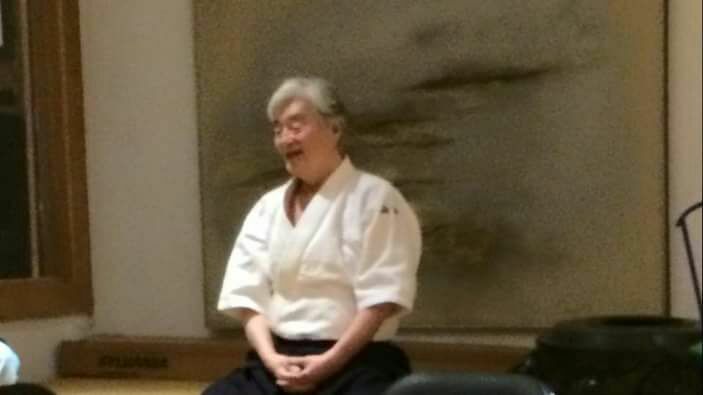 Pero su amigo y sempai, Nabuyoshi Tamura, quien fue la persona principal del Aikido Europeo, le ganó y Yoshimitsu Yamada fue delegado a la Costa Este de Estados Unidos. Eligió Nueva York como sede central. Los comienzos son siempre difíciles, pero lo que el joven profesor de Aikido tuvo que enfrentar en Nueva York requería de un enorme compromiso personal, paciencia y esfuerzo. El grupo de Nueva York no estaba bien organizado, nadie tenía experiencia en el manejo de una escuela de Aikido y Yoshimitsu tuvo que hacer todo desde cero, desde los asuntos de organización a la enseñanza de las técnicas. La falta de medios económicos no facilitó la situación y junto con el primer uchi-deshi de Nueva York, Ángel Tineo-Álvarez, vivían y dormían en el vestuario ya que alquilar un departamento era solo un sueño. Todo el dinero iba al mantenimiento de la escuela y las perspectivas no eran prometedoras. El aikido no era muy conocido en la Costa Este de EEUU y la posibilidad de promocionar este arte marcial usando los métodos tradicionales eran muy limitadas debido a motivos económicos, anunciarse en los medios era muy costoso. El único medio de presentarse era en exhibiciones públicas. Afortunadamente, gracias a la amabilidad de otras escuelas de artes marciales, abundaban las posibilidades de presentaciones públicas, por ejemplo durante los campeonatos de karate. De ahí que muchos alumnos provienen de dojos de otras artes marciales y querían probarse en nuevos terrenos. 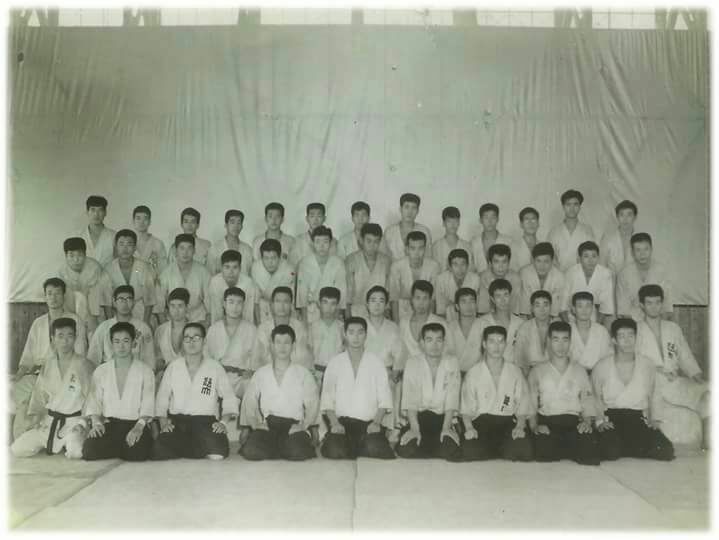 Estos primeros años fueron un desafío importante para Yoshimitsu, si bien estaba fuertemente apoyado por sus alumnos, quienes estaban involucrados en asuntos del dojo, algunos de ellos son Mike Abrams, Harvey Konigsberg, Harry McCormack, En los años 60 había un promedio de aproximadamente 50 personas entrenando en el dojo. El instructor principal de NY Aikikai no tuvo mucha suerte. La visa de intercambio cultural que tenía no le garantizaba una estancia larga en EEUU y eso amenazaba con ser deportado a Japón. Aparecieron nuevos problemas con el nacimiento de sus hijos. A los dos nacidos en EEUU se les otorgó la ciudadanía y podían quedarse. Yoshimitsu y su esposa y la hija mayor, nacidos en Japón no podían quedarse. Para intentar proteger a su familia de la despiadada ley de inmigración tomaron una difícil decisión: su esposa volvería a su país con los hijos. Esta separación de su familia cercana en esa época, es algo que Yamada Sensei lamenta hasta el día de hoy. Lentamente el aikido se fue haciendo atractivo para la gente no solo de Nueva York sino de toda la Costa Este. Esto fue principalmente debido al increíble compromiso de Yamada Sensei. Viajaba tanto, a Boston, sur de Nueva Jersey, Pensilvania y Canadá, que sus alumnos empezaron a quejarse de que no estaba nunca en Nueva York. Sin embargo, como él era la única persona con la experiencia correcta, tenía que ocuparse de todo. Los acciones de Yoshimitsu Yamada fueron deliberadas, trabajar en los cimientos resultó con el tiempo en que muchos grandes alumnos de entonces son profesores a día de hoy tienen sus propias escuelas. Estar tan involucrado en esta misión por la que fue enviado a EEUU empezó a producir efecto. Cuando la situación del dojo de Nueva York se hizo estable, el aikido más popular y los dojos en sí estaban operando efectivamente, llegó el momento de establecer una organización con el fin de formalizar y especificar la cooperación desde un punto de vista administrativo. Así, en 1968 se creó la United States Aikido Federation (Federación Estadounidense de Aikido). Esto fue debido a la cooperación entre los maestros delegados por Hombu Dojo en Estados Unidos y es la mayor organización de Norte América. Los problemas de visa terminaron en 1972. Yamada Sensei empezó a usar intensivamente la libertad adquirida para promover el aikido fuera de los Estados Unidos. 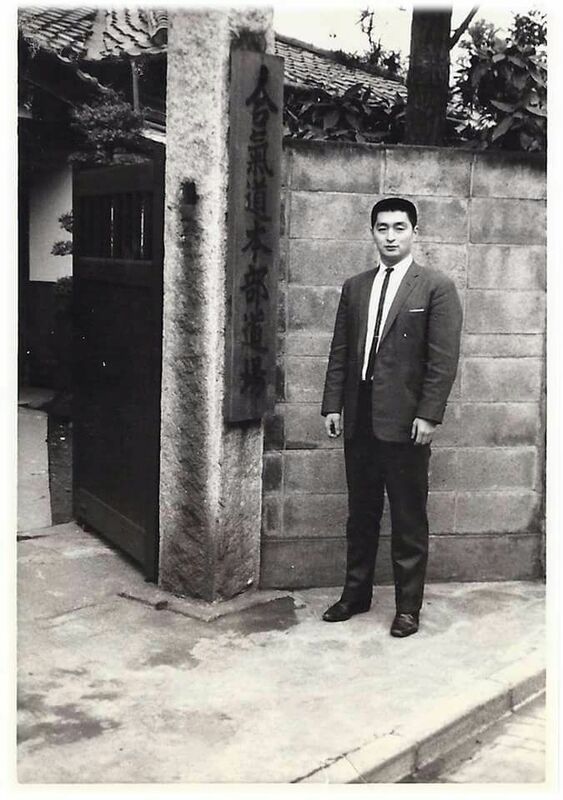 Uno de sus primeros viajes fue por una invitación de Tamura Sensei a Francia en 1973. Yoshimitsu Yamada pasó en Hombu Dojo alrededor de siete años. Desde aquel tiempo el conjunto de técnicas que se enseñan ha cambiado mucho y el aikido en sí es ligeramente distinto del arte marcial que los primeros uchi-deshi de Morihei Ueshiba aprendieron. A pesar de esta evolución, Yamada Sensei intenta transmitir las cosas que aprendió en ese tiempo. De enseñanza ortodoxa, enseña las técnicas básicas, que intenta no modificar. Cree que es necesaria una base sólida para un desarrollo apropiado. Es un entusiasta de la práctica intensa como medio de desarrollo tanto físico como espiritual. No se opone a la práctica dura, conforme al espíritu del budo, pero no justifica que haya brutalidad o estupidez en el tatami. Aún viaja intensivamente visitando casi todos los continentes. Es el presidente de la Federación Americana de Aikido y de Aikido Sansuikai International, asociación que nuclea a todos los países latinoamericanos y países de otros continentes. Es autor de numerosos libros y DVDs de aikido.